Unfortunately I only have a single pic of today's mani to share. Somehow I only uploaded one pic to dropbox. And I can't get to the others before I leave. I'll follow-up with more pics later because I love this mani!! I used the complete Orly Mash Up Collection. This collection has such a fun color story. It's all so random...yet it all works together. I figured a nail art look with all six colors would be equally as random and balanced at the same time! I've actually swatched this entire collection not once...but twice! I can't get the colors to photograph properly so I haven't posted them. But trust me...they're amazing and bright and awesome. This took a few passes with tape and topcoat to complete. To create two colors side by side, I taped off one color, applied Seche Vite, let them dry...then I taped off the next color, making sure the tape ever-so-slightly overlapped it's neighbor so there wasn't a gap. 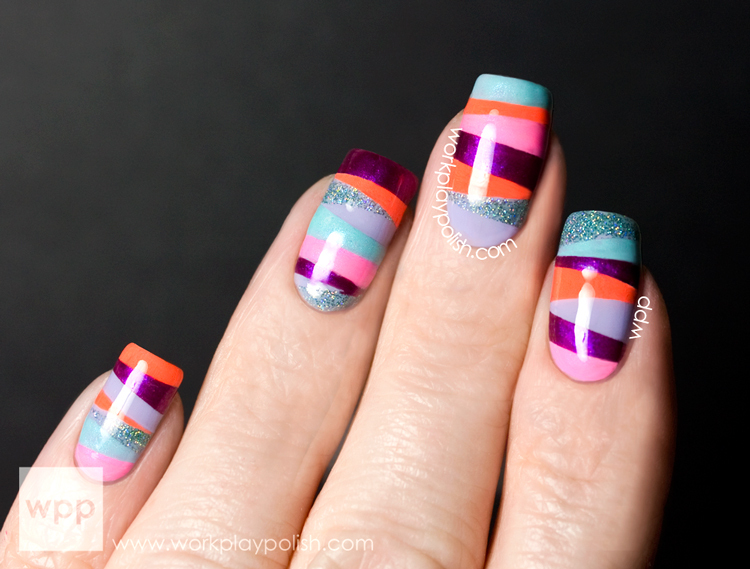 I could do several stripes per nail at a time, as long as they weren't side-by-side. So this wasn't as time consuming as it sounds. And again...I did some touch-up with a nail art brush and coated it with three (!!!) coats of Seche Vite to make it smooth. Love!